You can use your Web Component to collect data for anonymous surveys or studies by an creating an entry in your Web Component Menu, like the one pictured last in the image below. Be sure to leave the Contact Info check-box unchecked (see red square below). Depending upon your other settings, this will require clients taking the survey to only enter name and perhaps student ID. The trick here is to create a “Holding” client with a name like "Student Survey" and student ID 000. Of course, I made up the name and ID here. You can use anything you like. Tell your clients to use that name and ID when completing the survey. The survey data from all participants will be saved in Mr. Survey’s case file in Titanium. The trick here is to create a “Holding” client with a name like "Student Survey" and student ID 1111. Of course, I made up the name and ID here. You can use anything you like. Tell your clients to use that name and ID when completing the survey. The survey data from all participants will be saved in 'Student Survey’s case file in Titanium. Using the Web Component optional feature to collect anonymous student surveys greatly depends on how your web component was secured. All methods can be used for anonymous poll. Workstation dependent access: only via specific IP addresses assigned to devices in your center. Campus dependent access: allowed to all devices on the secured University subnet. Worldwide access: allowed unfettered access by internet users. 1 is the most common for most university centers. Each client would need to visit the lobby to enter their poll. 2 is the access you'd need to poll the university body at their leisure. Each client could fill out the poll from any computer on campus. 3 is usually only used in scenarios where community outreach necessitates that open access from the internet to the forms used in Titanium Schedule. Instruct clients to use "Student Survey" (or something other appropriate) as the client name and 1111 (or something as easy) as the Student ID. All surveys will be submitted to this "client". Easily reviewed as you wish. Center Workflow: send an email to all clients from the last semester asking for survey. 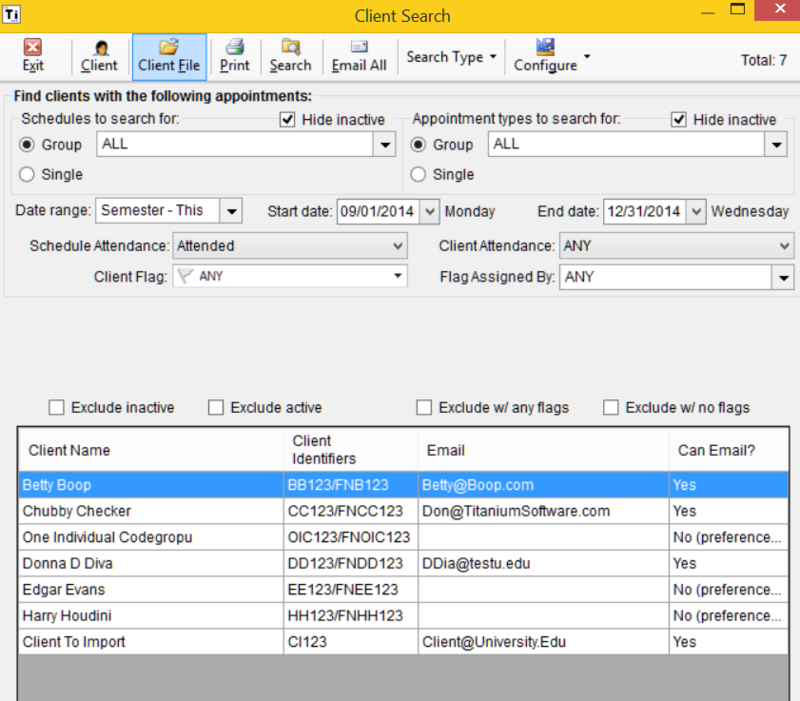 Open > Advanced Client Search, Date range: Semester-This, Schedule Attendance: Attended (assuming you'd only want to poll clients that had actually been to appointments). Press [Search] and it'll find everybody. Press [Email All] and it will start an email in your default email client with everybody's email pasted in the Blind Carbon Copy address line. Well... everybody that has an email address entered and is set OK to contact via email. 2. supply them with an internal campus link which would require them to enter their university login credentials to access the web component page. The credentials are to verify they are an enrolled student, not for use of the anonymous survey. 3. supply them a web link to a location on the university website which allows anonymous access. Since the surveys are done anonymously there is no way to go back and request followup on surveys. Remember, all incoming surveys are to only one client, "Student Survey".